Tokyo, Japan – November 26, 2014 – LINE Corporation, owner and operator of the free call and messaging app LINE, has released sales and usage results for the 6 month period from the launch of LINE Creators Market, a platform where users can produce and sell LINE stickers, until November 7. LINE Creators Market is a platform that offers users from around the world the ability to produce and sell their own LINE stickers. After passing a review process conducted at LINE, creator stickers are made available for sale and purchase on the LINE Store, as well as LINE’s in-app Sticker Shop, and creators receive approximately 50% of all revenue from sticker sales. 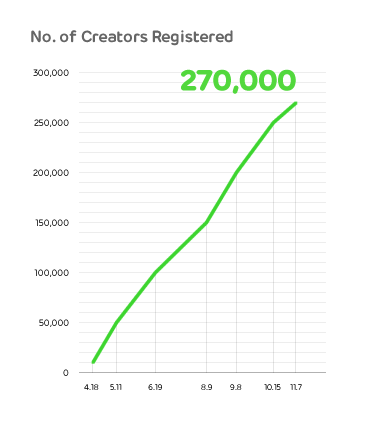 Over approximately the last 7 and a half months, since the Creators Market began accepting sticker registrations from creators on April 17 until November 7, 2014, over 270,000 creators have registered with the service (figure 1), with creators hailing from 145 different countries. In addition to independent creators, famous entertainers, companies, local government organizations, sports teams and many other people and groups have also created and sold their own stickers. This has resulted in creators from many different genres participating in the service, and the Creators Market has become a platform used by people not only in Japan but throughout the world. Furthermore, the number of stickers sets currently on sale as of today has surpassed a total of 30,000 sets, with stickers created not just for communication but those focused on raising character awareness and creating connections with users, as well as specific regional dialects, occupations, and many other unique new genres. A large number of stickers that have gained popularity through the Creators Market have also been commercialized into various different goods, producing new value above and beyond that limited to a communication tool. Looking at creators stickers that have become available for sale and purchase after passing the review process since April 8, in the 6 month period up until November 7, total sales derived from all creator’s stickers has reached JPY 3.59 billion, with a total of 35.95 million sticker sets purchased. Looking at stickers broken down by sales, the top 10 ranked sticker sets have achieved an average of JPY 36.8 million in sales. Going further down the rankings, the top 30 ranked sticker sets have achieved an average of JPY 23.6 million, the top 100 an average of JPY 13 million, the top 500 an average of JPY 4.6 million in sales, and the top 1,000 an average of JPY 2.7 million. As many users continue to purchase sticker sets, the pace of this growth is accelerating even now, half a year after the service launched. Meanwhile, a comparison of the amount of sales achieved by individual sticker sets (Graph 3) shows that 40.8% of stickers currently on sale have earned JPY 10,000 or more in sales as of November 7, meaning that stickers other than those in the top-grossing ranks are also being purchased and used widely by users, and that LINE Creators Market has grown to become a platform through which individual creators with excellent and creative ideas can earn income through their own self-made stickers. As the leading provider of sticker-based communications, LINE will continue its efforts, including the Creators Market, to extend the reach of our communication platform even further throughout the world.